Little mistress empire waist chiffon maxi dress with embelished neckline and keyhole. Little mistress maxi dress size 10. Condition is used with slight defects as shown in the photos. Adjustments have been made to the bust fitting (comfortably size 10) as a result ofndress being ill fitted at time of purchase. Product care; hand wash only/do not tumble dry/iron on reverse side/do not dry clean. Dispatched with Royal Mail 1st Class. BNWT!!! 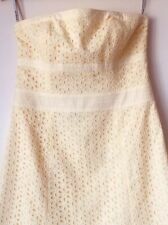 H&M WHITE COTTON BRODERIE ANGLAIS WEDDING, BRIDAL DRESS. SIZE 14. WHITE BRODERIE ANGLAIS WITH CROCHET TRIM. MATERIAL COTTON AND POLYESTER WITH A VISCOSE LINING. LOOSE BODY. OPEN BACK WITH WIDE ADJUSTABLE TIE. This is applied automatically upon checkout. If it is within our power, then we will try to resolve your issue. PHASE EIGHT Gorgeous Red/Black Stretch Soft Jersey Patterned Wiggle Pencil Dress size UK14 - Wedding. Features a elegant cowl neckline with a subtle drape. The most gorgeous dress from Phase Eight. Stunning for wedding invitations, races, parties. Would be lovely prom dress or party evening. This was bought for my granddaughter For Wedding. Here is a rather lovely floral dress from Phase Eight in a size 14. A gorgeous dress for all kinds of occasions. A mock wrap bust area with perfect pleat detail, empire line and fully lined in polyster. Size UK 16L. Genuine PER UNA M&S with all inner labels intact. Broidery anglias cotton. Fully lined in lightweight cotton. Waist - 18". Length shoulder to hem - 46". Genuine PER UNA M&S with all inner labels intact. Bold deep pink red floral print. Embroidered cotton. Fully lined in lightweight cotton. Bust - armpit to armpit - 19". Waist - 18". Length shoulder to hem - 48". This is a stunning dress from the Spotlight Range at Warehouse. It has a brilliant white cotton crochet outer layer over a plain chiffon lining. V chiffon insert at the front, back has button fastening, keyhole opening and the zip fastening. BEAUTIFUL PRINTED LINED COTTON SLEEVELESS DRESS. UK SIZE 14. ======================. The dress colour is very light pink base with pretty floral pattern, fully lined throughout. JOE BROWN'S STUNNING LUXURY COTTON. DRESS WITH BEAUTIFUL FLORAL PATTERN DESIGN. Gorgeous dress. This is a stunning superbly made designer dress. Lovely, floaty occasion dress from Berketex. In very good pre-worn condition. Floaty, semi sheer top layer. Black with bold pink floral print. The pattern on the black is raised. Dress length shoulder to hem is 102cm. Arm pit to arm pit is 43cm. Waist straight across the band at the front is 39cm. 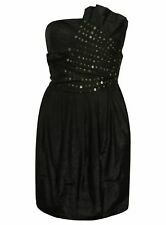 Karen Millen Little Black Dress Size 14 Midi Bodycon White Striped Gorgeous . Condition is Used. Dispatched with Royal Mail 2nd Class.